Molly Olsen of Fairbanks leaps for a layup while a Mechanicsburg defender gets her hands on the ball. The Panthers lost, 69-30. Lady Panthers of Fairbanks are a team that has been trying to take small steps to cover a lot of distance at the end of this basketball season. Sometimes those steps may be smaller than they would like, as was evident Friday night. The Lady Panthers lost their Homecoming game, 69-30, to Mechanicsburg. Fairbanks coach Landon Fraker said the game was frustrating for him and his Panthers. However, he saw progress from the first game against the Indians. “This was one of those frustrating games where we just didn’t do a whole lot right and we are better than that,” he said. “Playing these teams the second time around, I always like to compare. The Lady Indians put on a hard press early, but the young Panthers were able to work their way up the court. They took an early lead with the help of some low post play and some solid shooting from beyond the arc. The downfall for the Panthers came on the defensive side of the ball, as they couldn’t handle Mechanicsburg’s low post play. That allowed Mechanicsburg to climb to a 19-7 lead at the end of the first quarter. Fraker acknowledge the defense lapse, but said the Panthers’ shooting was also lacking. “We had trouble stopping them on defense,” he said. “We switched up defenses and tried some different ones. The Lady Panthers continued to push to the rim in the second quarter, but struggled to find the bottom of the basket. The Indians kept pushing the ball low. By the half, Mechanicsburg had a 36-14 lead. In the third quarter, the Lady Panthers found some offense from the free throw line. 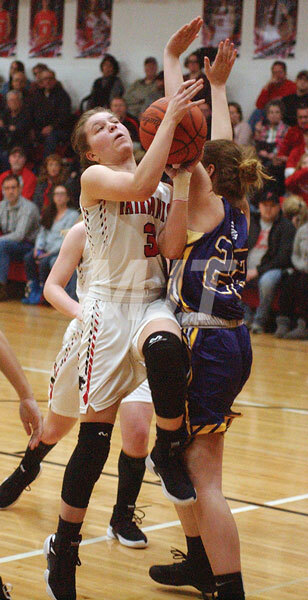 With some solid drives to net, FHS drew some fouls out of the Indian defense, but with the early damage was done. The Panthers could only claw back to a 52-22 deficit at the end of the period. Fraker added that his team has gotten better as he has seen periods of solid play. With the gap in double digits for the Panthers, the Indians where able to take the win with ease as the Lady Panthers fell to 1-20 on the season. The Panthers will return to action Thursday for their final regular game of the season at home against Northeastern. The box score was not available by press time.